Marjorie A. (Hunt) Hurd, 88, passed away surrounded by her loving family on January 10th, 2019, at Oak Grove Center in Waterville. Marjorie was born in Madison on August 22, 1930 to Edwin and Josephine (Fluery) Hunt. Margie graduated from Madison High School and enjoyed a twenty year career at New England Telephone Company. Prior to her time with New England Telephone, she owned and operated The Red Barn Fabric Store in Princeton with her first husband, Charles. In 2005, Margie married Duane Hurd in a beautiful summer wedding. Margie and Duane enjoyed summers in Maine and warm winters in Florida during six special years together. Margie had fond childhood memories of summers at Maidstone Lake in Vermont. Florida and Prince Edward Island were her favorite annual trips. Later in life, Margie enjoyed adventures abroad to destinations including Scandinavia, Russia and Europe. She was predeceased by her brother Harold Hunt, sister Beverly (Hunt) Fortin, and husbands Charles Hitchings of 19 years, Ward Shannon of 29 years and Duane Hurd of 6 years. Margie is survived by her children Sam and wife, Robin Hitchings; Craig and wife, Mary Hitchings; daughter Laurie and husband, Sherwood Booker; John and wife, Emma Shannon; Tom and wife, Kristi Shannon; as well as nine loving grandchildren; and thirteen great grandchildren. Margie was a thoughtful person who was exceptionally kind and considerate to others. 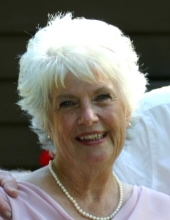 Through sewing, quilting, knitting and particularly her beautiful singing voice, Margie exhibited great pride in bringing happiness to her family and friends. A service is scheduled at Fairfield United Methodist Church on January 24th at 11:00AM with a brief service to follow at the Maine Veterans Cemetery in Augusta at 1:00PM. In lieu of flowers, donations are welcome to Fairfield United Methodist Church and Meals on Wheels in Waterville. The family expresses their profound appreciation for the loving and professional healthcare provided by Oak Grove Center staff during Margie's final days. To send flowers or a remembrance gift to the family of Marjorie A. (Hunt) Hurd, please visit our Tribute Store. "Email Address" would like to share the life celebration of Marjorie A. (Hunt) Hurd. Click on the "link" to go to share a favorite memory or leave a condolence message for the family.